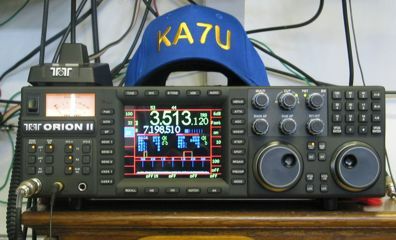 A very good place to get information on this radio is from Ten Tec's ORION II page on the web site located at: http://radio.tentec.com/Amateur/Transceivers/TT565 . There are many links to definitive information about this radio there. The September, 2006 edition of QST magazine has a product review by Rick Lindquist, N1RL. The QST review refers to the Ten Tec Reflector located on http://www.contesting.com . This reflector is a good resource for specific problems encountered in the ORION and ORION II radios by users. Occasionally a solution or resolution to the problem can also be found in the archives of this reflector. The firmware revision at the time of the review was ver. 2.038j. An excellent and I believe objective review and wish list for the ORION II is maintained by Ron Castro, N6IE. If you are interested in an objective and constructive review, you should check out this web site: http://www.ronc.users.sonic.net/ . So what do I think of the ORION II? I truly appreciate it! I would not sell or trade mine for less than the price of a new one and then only if a replacement was available within the week. It is a "stand alone" radio and will work without computer connections. It can be connected to a computer as I demonstrate on the CAT & Logging page of this web site. 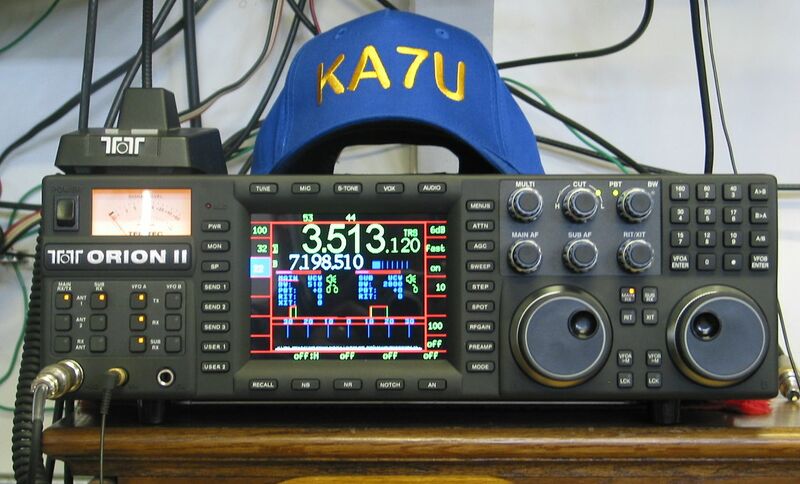 I'll list a few of the ways this radio serves here at KA7U. I listen to it a lot. I can hear things on this radio that I only imagine I can hear on other receivers. The dual receiver capability provides an easy method to monitor signals around a station of interest, without having those competing stations "swamp" the station of interest. See my CAT & Logging page for a waterfall view of this. This radio can be controlled by computer software via serial port connections. Using software to control the radio makes many tasks easier and more efficient to do. For example: a logbook will automatically insert the frequency of the station being worked and with the addition of call book data either from the web or on your computer, the log book will complete the name and QTH information for you. Connecting this radio to a computer sound card is very easy with the outputs provided on the back of the radio. 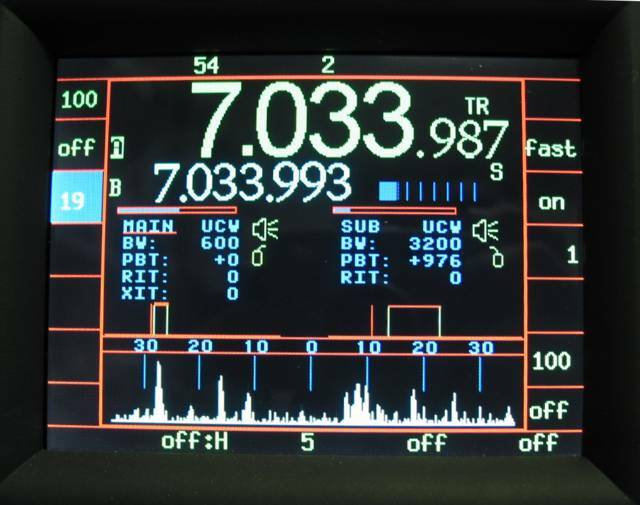 Software packages range from free to "try before you buy", that will generate PSK, RTTY, SSTV, and other modes currently used in our Ham bands. This radio is an opportunity to learn and use current software defined (SDR) radios. Once you really start using this radio, you will be wanting more and more. It is like eating popcorn or making contacts in a contest. CAUTION, this radio can become an obsession and your desire to achieve more with it than it will ultimately deliver, may disappoint you, BUT, it really isn't Ten Tec's fault that once you learn what might be done, that what you have doesn't quite do it. After all, where is the limit of imagination? This radio will run for hours in continuous duty during a contest and never miss a beat. This radio has never failed to operate, not even once while turned on. I have learned that I can count on my ORION II to get the job done in a contest with the most elaborate filter settings, computer control using MixW to align the radio to calling stations and so forth does not cause any problems with this radio's hardware or firmware works. In my opinion the ORION II stands alone as a software defined radio that can be used with out connection to a computer, and as a radio that can be computer controlled.